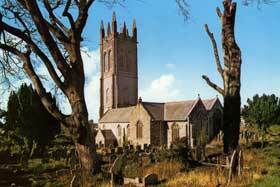 Probus has the highest church tower (125ft. 10in.) in the whole of Cornwall. 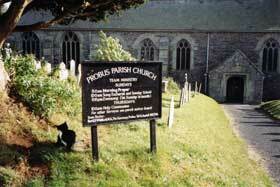 Vera and Harry Hotten visited Probus in 1991. The headstone is inscribed In memory of William Hotten of this parish who departed this life Nov 21 1818 aged 68 years also in the memory of Ann wife of the above. 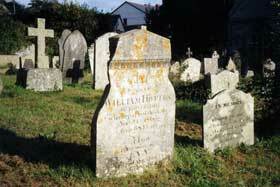 The smaller headstone to its right is inscribed George Huddy of Trelowihas in the parish who departed this life the 1st of April 1770, aged 60 years. George Huddys age and date of death could make him the brother of Ann Huddy who is linked to the Hottens by marriage and was the grandmother of John Hotten who founded the West Ham branch of the family.